Tormented magician Ernie Weiss and his estranged girlfriend Esther separately struggle to get their lives back on track after the death of Weiss’s brother, Howard, whose death during an underwater escape stunt may or may not have been deliberate. Fighting to keep his senile mentor Al Flosso from the authorities, Weiss agrees to train the daughter of a homeless con-man. 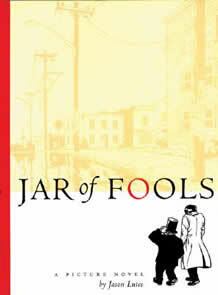 Vague this synopsis may be, but Jar of Fools is a story about character rather than contrived plot. Lute’s masterful depiction of the suffering subconscious, and the trickery it plays upon our dual protagonists, is reminiscent of Paul Karasik and David Mazzucchelli’s graphic novel adaptation of Paul Auster’s novella City of Glass. Conversely, Fool‘s has the intimacy and introspective slant of a short novel. Like Auster, Lutes has captured the fragility and anguish of existence. His characters continue for the sake of continuation, gripping tightly to the melting imagery of precious nostalgia. The humble artwork is deceptively simple, with Lute’s 12 panel layout lending the book a claustrophobic, deliberate pacing that has been compared to the films of Jim Jarmusch, though in many ways Weiss’s search for answers to his brother’s death, and the inexplicable human demand for closure, is similar to Todd Louiso’s film Love Lisa. There’s a wholly gratifying experience to be gleamed from Jar of Fools, just by comparing the artwork, panel composition and Lutes’ unique sense of mise en scene at each end of the book. By the end of Jar of Fool Jason Lutes’ storytelling proficiency has evolved alongside his characters. There’s a level of honesty in Lute’s illustrations that helps Fools evade the Robert Crumb or Daniel Clowes caricaturist approach that so many similar independent books hope to trail. Weiss’s apartment is cluttered, grimy and unromantic, the streets he wandered cracked like their inhabitants broken dreams. Esther’s legs are unshaven, her hair boyish and unattractive. These tiny details draw you into an experience that is more cinematic than literary. I’ve perhaps applied one too many comparisons to other works, but that be because, despite its superb execution and affectionate, sympathetic characters, Jar of Fools lacks a personality of its own. I was perfectly happy with Lutes’ intention for his characters to find their own way, though I suspect many readers will, much like Ernie Weiss, expect a little more in the way of closure. Jar of Fools is an outstanding book, highly recommended to those who view the alternate comic scene as a literary field fuelled by thirty-something males unable to overcome decades of repressed teenage sexual angst. Though it does contain plenty of that, too.